I never really think of myself as a judgmental person... until I stop to think about it. Then I remember that judgment is pretty much central to a lot of my relationships. I tend to have a pretty black-and-white outlook on other people - they are good people or bad people, useful or useless, kind or douche-y. Occasionally people change categories on me, and that is when I catch myself categorizing them in the first place. I was reminded of this while reading a Christian book this afternoon that quoted Matthew 7:1-5. It says, "Judge not, that you not be judged... Why do you look at the speck in your brother's eye, but do not consider the plank in your own eye?... Hypocrite! 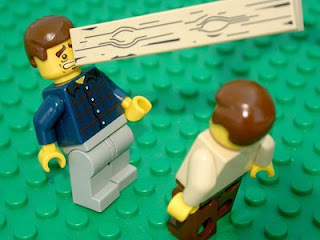 First remove the plank from your own eye, and then you will see clearly to remove the speck from your brother's eye." I love this passage because it reminds me how futile my own judgment is. I remember reading this once, and it struck me that if you have just taken a PLANK out of your eye, you might not be so concerned about your brother's speck. Also, if you are going to help someone take something out of their eye, you are going to need to handle that plank issue first, or you will not be able to help much, and you might even make things worse. You could poke your brother's good eye with your own eye-plank! I think that happens a lot in churches - people mean well and are often trying to help, but they just end up making things worse. The easiest people to judge are judgmental Christians!! They make such a mess, lol. So there's my double-edged Scripture passage for the day - a good reminder, and food for thought about how a judgmental attitude creeps up on me and then makes a mess. My first thought was, "Matt & Alyssa have lego??" Thanks for clearing that up for me. The judging thing is kind of comical if you think it through, isn't it? Thanks for your clear, concise thoughts.